After the panel completely falls apart on the eve of recording a Dawn of War 2: Retribution episode, Troy and Rob soldier on by themselves. Troy hasn’t played Retribution, but he is happy to announce his upcoming marriage to Field of Glory. Rob forgets that he’s on a podcast and just starts talking with Troy, and along the way he mangles a great Provost Zakharov quote and explains why he thinks refinement is undervalued compared to innovation. At the end, Troy talks about his upcoming meet-up, and Rob asks for listener input on a 3MA website. Then Audacity eats his audio file and the entire episode must be produced from a Skype recording. Would that my makeshift time fillers were as good as this weeks podcast. Great to have Mr. Goodfellow back, of course. I do hope that his new work life makes him understand that non-professional gamers can benefit from hearing about classic games like Field of Glory that we may have not had time to play. I’d love a remake of Crush, Crumb, Chomp, the EPYX game of movie monster mayhem. Is it strategy? Mr. Chick might say so, so I’m hiding there. I have played it under emulator, but C=64 graphics still haven’t aged well. I’m new to 3MA, but this is the podcast I have been looking for! I ended up downloading every past episode. Your Victoria 2 episode alone caused me to buy, and subsequently love, the game during a recent sale. It would be great for 3MA to have its own site, if only to have a forum for 3MA’ers to discuss and get together to play one another. A new, but ardent fan. That was an unexpectedly great discussion. I think Troy might be at his best when simply given room enough to ramble about why a game works. Good to hear Troy on again, Talk about rough months, yeesh. 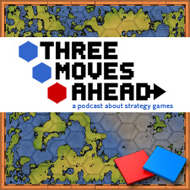 Here’s to 90 more TMA’s, the best strategy game podcast in my house! Not that I don’t enjoy the more abstract subjects of some episodes, but I have to say that I continue to wish that the podcast would spend more time on “current” games. I don’t expect you to chat about something just a few days after release, but a week later is a nice time to hear some people who’s opinions I’m interested in at least give me a sense of what they think. And it doesn’t have to be the focus of the entire show – Gamers With Jobs manages to spend some time on new releases and then moves on to “meatier” subjects. I’ll say that Men of War hasn’t replaced Close Combat for me, but has replaced army men and miniatures. The immense detail and autonomy of your soldiers is amazing, and it replicates the feeling of a sandbox. You mentionted Warcraft 3’s plan of doing an RTS focused on heroes with a small number of units, but then seemed to forget that they did that with the Orc campaign in The Frozen Throne, 6 years before DoW2 ressurected the idea. As for what franchise I’d like to see ressurected, Alpha Centauri. Even if it was just a graphical update with a bit of refinement like Civ4:Colonization was. Didn’t listen to this podcast yet, but yes they are awesome and I’m now going through the backlog. What I wanted to ask is, am I only the only one that sees imageshack’s frozen frog instead of images in the posts? Including this one? The description of the podcast was probably a tad unfair. My expectations were low as I thought it was going to be Rob and Troy talking about Retribution. The discussion about Field of Glory and then refinement and innovation was interesting. Well done. Related to the description, the Itunes page for the podcast describes Troy as the host. I assume that might be something you want to change. As for the website, I imagine you will want it to be fairly low maintenance. Posts for each podcast and a comments system would be fine with me. One final scattered thought, Bruce’s War in the East AAR at Quarter to Three deserves a shout-out and link at the bottom of the podcast. I have enjoyed it immensely and I think other listeners may as well. I really enjoyed this one. The podcasts on games that I have actually played (whether they are current or classic games) are great, but sometimes if the focus is on a game which doesn’t interest me, the podcast isn’t interesting (to me). I’d almost prefer each podcast to begin with maybe a 15 minute “games I’ve been playing” session, much like Jumping the Shark does. Anyway, good show this week! I also liked the discussion quite a bit, so don’t sell yourselves short, guys! 1. Empire: Total War – I seem to be the regular apologist for this game on the FoS comment threads… I had the good fortune to come to E:TW after all the patches, and at the _design_ level, I love the game for all the reasons Troy mentioned in his review and in his dissent to Tom’s review. (Heck, even Tom acknowledges the good ideas in the strategic game.) The _execution_ suffers from weak AI… but if I could stomach it in Rome and Medieval 2, I can stomach it in Empire. And the multiplayer campaign (which I finally got the chance to try over the weekend), which obviates the AI issues, was one of the most fun strategy experiences I’ve had in a very long time…. when it wasn’t crashing. 2. Games I want to see remade – Emperor of the Fading Suns! In its combination of ambitious design with bugginess and lousy AI, it was the Empire: Total War of its day. But no game ever since has matched its original vision of a 4X game set in a Dune-like galactic empire, and I so badly want to see the concept done right. 3. Website – I’m actually happy to see 3MA continue to reside on Flash of Steel – I like having all my strategy game goodness centred in one place! But I understand why you guys may need to move it. Rob (I think), please be aware that your mouse clicking and computer noises can be heard during the show; it’s quite distracting. It’s unlikely that’s me, though occasionally you will hear me typing in the background to check something I’m saying or see what someone is talking about. I wouldn’t call them remakes necessarily, but they are old chool game types. 1. A turn based starship simulator set in an interesting and plausible universe. It could be set in something like the Honorverse, Ender’s Game, The Risen Empire or Traveller. 2. A hex and counter tactical wargame with nice looking high resolution 2d graphics, an intuitive and attractive UI, and good game documentation. I would prefer something set in the 16th-19th century, but at this point I will settle for just about anything. 3. Not a strategy game, but I’d really like another party based turn based RPG in the vein of Wizardry VII: Crusaders of the Dark Savant. Except maybe not as much of a grind and less repetitive. Things to put in a podcast website – an index of links with descriptions to organizations that you often mention (eg Gamers with J0bs), to columns that you and regular columnists have written (what’s the link to that last, controversial column you wrote, Troy?) and to info about the games mentioned in each podcast (if not all of them at least selected ones). I would wait for a month or so before deciding a “best wargame of the last 5 years” cos at last Combat Mission: Normandy is nearly here and I can’t wait to hear what you think of it. As for the actual content: I don’t think that 3MA also need the “standard” section of “watcha been playing”. Maybe rotate the podcast content with recent/open game talk (more or less an extended Watcha Been Playing) and the topic-centric episodes. Ah, and I find it confusing the Rob wraps up the show and THEN ask for last thoughts. I was having a slight problem bringing the show to a close, especially because we are often in the midst of a great conversation when we hit our time-limit. I don’t think the time-limit is a problem. I’ve broken it happily when we’re cruising along, but I think an hour is a good length to aim for. So at some point we need to wrap it up. So I break-in to do the wrap-up and housekeeping, then let everyone have a chance at concluding the discussion. I’m actually pretty happy with doing it this way. I know listeners will actually stick around for our PSAs, and we get to put in the last word on the topic at hand. It’s a method I hope to execute better and better in the future, but I do think it’s the best way to bring this type of a show to a close. 1. As Troy pointed out, some kind catchy or at least less formal opening bit could be nice. It seems like you turn your serious voice on sometimes for the first sentence or so and then revert to normal Rob mode. 2. Considering that TMA is one of the biggest (or only) places for PC strategy games on the web, it seems that there’s an opportunity to build a bit more of a community around it. Something like opening a discussion topic/thread for each major strategy release where people can come together to exchange thoughts and maybe arrange some multiplayer is an idea. In the case where there is a TMA show on the game, that could obviously serve the purpose. I’m a bit confused about the attribution of Dawn of War being revolutionary for RTSs. Didn’t Company of Heroes implement the whole cover system before DoW? Nope. Dawn of War (the first one) came out in 2004, Company of Heroes in 2006. Dawn of War had terrain effects and morale and while CoH might have gone much further with cover and terrain, it was nonetheless following-up on DoW.